Check out the amazing machines that make space travel possible. From the spaceship itself to the wrench needed to make in-flight repairs, machines of every kind are the backbone of space travel. In this, the third book in the Dr. Dave Astronaut series, the former NASA astronaut takes readers on a tour of the incredible equipment that allows humans to travel, live, and work in space: Kids will be fascinated to find out: - How spacecraft have evolved from the 1960s to today - How rockets power the spacecraft for liftoff--and enable it to re-enter Earth's atmosphere - All the equipment a spacesuit contains--including a TV camera - How Robonaut, the on-board robot on the ISS, works and contributes to missions With its focus on technology and engineering, this book is a must-have addition to any STEM studies. 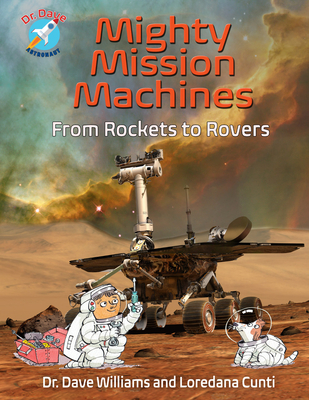 Lots of photos and humorous illustrations make this an entertaining way to get kids interested in the nuts and bolts of space travel today and into the future.